Cornelius Alexander Mack (December 22, 1862 – February 8, 1956), born Cornelius Alexander McGillicuddy, was an American professional baseball player, manager, and team owner. Considered one of the greatest managers in Major League Baseball history, he holds records for wins, losses, and games managed. He managed the Philadelphia Athletics for 50 consecutive seasons. His team won five World Series and nine American League pennants. They also finished last 17 times. In his playing days, Connie Mack was a star catcher for the Washington Nations in the 1880s and the Pittsburgh Pirates in the 1890s. He managed the Pittsburgh team before taking over the Philadelphia Athletics in 1901. Mack eventually became sole owner of the Athletics and did not retire until after the 1950 season, when he was almost 87. Mack's 53 years as a major-league manager gave him career figures not approached by any other manager. He managed 7,755 big-league regular-season games and 43 World Series games, nearly 3,000 more than John McGraw, who is second to Mack in games and victories. Mack's teams won 3,731 games and lost 3,948. He managed almost twice as many losses as anyone else in history; second was Bucky Harris with 2,218. With his refusal to give up despite losing season after losing season, Mack became the enduring, implacable symbol of baseball's resiliency and relentless optimism. Reserved and dignified, Mack left an indelible stamp on baseball. Born in East Brookfield, Massachusetts to Irish immigrants on December 22, 1862, Mack was a journeyman catcher who played 11 seasons in the National League beginning in 1886, the last three as a player-manager with the Pittsburgh Pirates from 1894 to 1896. In 1901, he became manager, general manager, and part owner of the fledgling American League's Philadelphia Athletics. When New York Giants manager John McGraw called the Athletics "a white elephant nobody wanted," Mack adopted a white elephant as the team's logo, which the Athletics have used for all but a few years since. He also cut a distinctive figure himself with his personal rejection of wearing a team uniform in favor of a business suit, tie, and fedora. He later became a full partner with Athletics owner Ben Shibe. Under an agreement with Shibe, Mack had full control over baseball matters while Shibe handled the business side. When Shibe died in 1922, his sons took over management of the business side. When the last of Shibe's sons died in 1936, Mack became the full owner. On the field, Mack was quiet, even-tempered, and gentlemanly, serving as a father figure to his players as much as a coach, and was universally addressed as "Mr. Mack." He always called his players by their given names. Chief Bender, for instance, was "Albert" to Mack. Veteran players welcomed the opportunity to play for Mack. The 1927 Athletics, though nowhere near as famous as the New York Yankees team of the same year, are considered one of the best second-place teams in history, featuring several future Hall of Fame players, including veterans Ty Cobb, Zack Wheat, and Eddie Collins as well as players such as Lefty Grove, Al Simmons, and Mickey Cochrane in their prime, and rookie Jimmie Foxx. Mack was known as being tight-fisted financially. Seeing baseball as a business, he once confided that it was more profitable to have a team get off to a hot start and ultimately finish fourth, than to finish first. "A team like that will draw well enough during the first part of the season to show a profit for the year, and you don't have to give the players raises when they don't win," he said. The most famous example of Mack's alleged stinginess came on July 10, 1932, when the Athletics played a one-game series with the Cleveland Indians. To save train fare, Mack only brought two pitchers to the game. The starting pitcher was knocked out of the game in the first inning, leaving only knuckleballing relief pitcher Eddie Rommel. Rommel pitched 17 innings and gave up 33 hits, but won the game, 18-17. However, Mack also had a generous side for players in need. For instance, he kept Charles Albert "Chief" Bender on the team payroll as a scout, minor-league manager or coach from 1926 until Mack himself retired as owner-manager in 1950. Al Simmons was also a coach in the Athletics organization for many years after his retirement as a player. Mack managed the Athletics through the 1950 season, when he retired at age 88. His 50-year tenure as Athletics manager is the longest ever for a coach or manager with one team in North American professional sports, and this record will likely never be threatened. He remained owner and president (though his sons took an increasing role) until the Athletics moved to Kansas City, Missouri after the 1954 season. Through his unequaled 53 seasons as a manager, he won nine pennants, appeared in eight World Series and won five of them. He built two dynasties: from 1910-1914 (which featured Mack's famous "$100,000 infield" of Collins, Home Run Baker, Jack Barry, and Stuffy McInnis); and again from 1929-1931 (which featured Hall of Famers Grove, Cochrane, Foxx, and Simmons). His 1911 and 1929 teams are considered by many to be among the greatest baseball teams of all time, and his 3,776 lifetime wins are a major-league record—as are his 4,025 losses and 7,878 games managed. Mack twice dismantled his best teams. He broke up his first great team in outrage when some of his star players started signing lucrative contracts with upstart Federal League teams. Some of these players also reportedly "laid down" during the 1914 World Series, in which the heavily favored A's were swept by the Boston Braves, a team that had surged from last place on the Fourth of July to the National League pennant. Mack sold, traded, or released most of the stars who didn't jump to the Federal League (Collins being one notable exception). The collapse was swift and total; the team crashed from 99 wins in 1914 to 43 wins in 1915 and last place. Mack's 1916 team, with a 36-117 record, is often considered the worst team in American League history, and its .235 winning percentage is still the lowest ever for a modern (post-1900) big-league team. All told, the A's finished last seven years in a row from 1915 to 1921, and did not contend again until 1925. Mack broke up his second great team, the 1929-1931 Athletics, due to financial difficulties from the Great Depression. He had every intention of building another winner, but he had not invested substantially in a farm system. While the Athletics finished second in 1932 and third in 1933, they fell into the cellar in 1935 and finished either last or next-to-last all but once through 1946. Aside from 1948 and 1949, Mack's teams were never again a factor past June. Mack was also known by the nickname "The Tall Tactician" and, in his later years, the "Grand Old Man of Baseball." He died on February 8, 1956. The Philadelphia stadium, previously called Shibe Park, was renamed Connie Mack Stadium in 1953 (starting in 1909, it was home to the Athletics, and starting in 1938, it was also home to the Phillies, then from 1955 to 1970 it was home to the Phillies alone after the Athletics moved to Kansas City). Mack's son Earle Mack played several games for the A's between 1910 and 1914, and also managed the team for parts of the 1937 and 1939 seasons when his father was too ill to do so. In more recent years, Mack's descendants have taken to politics: his grandson Connie Mack III was a member of the U.S. House of Representatives from Florida from 1983-1989 and the United States Senate from 1989-2001, and great-grandson Connie Mack IV was elected to the House from Florida's 14th Congressional District. 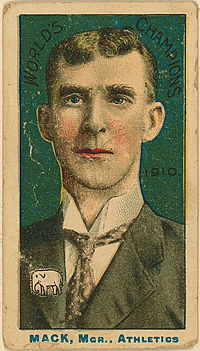 Mack was elected to the Hall of Fame in 1937. ↑ Woolf, S. J., "Tyrus Cobb — Then and Now; Once the scrappiest, wiliest figure in baseball, 'The Georgia Peach' views the game as played today with mellow disdain", New York Times, September 19, 1948, p. SM17 (Magazine section). 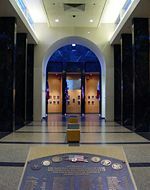 Baseball Hall of Fame – www.baseballhalloffame.org. Career managing record and playing stats – www.baseball-reference.com. This page was last modified on 20 March 2017, at 16:10.